I don't receive any form in my email anymore, is there anything wrong ? I used to use Jotforms and everything was ok , but starting of September 3th, we don’t receive the forms in my emails anymore as usual, so, I found a lot of contacts in my jotforms account but not in my emails, all tests were done and the test messages have reached my email but no real forms at all! , I would like to know if there is anything wrong to be able to fix it the soonest possible! Waiting for your soonest feedback and Thanks in advance for your very kind attention! Sorry for the inconvenience that may have caused. Regarding on this issue, would you mind if we ask to provide us your Form URL or your website url where your form embedded for further assistance? Hello egitoturismo. In addition to pinoytech's response, can you also check your inbox if you received an email with the subject line: New submission: notification testing? I made a test submission using my form if you're able to receive notifications properly. We'll look forward to your reseponse. also, please be informed that we have 2 websites , and the same problem happens in both site not only this one! Thanks in advance for your help and waiting for your feedback! Thank you for providing us the URL of your pages. I noticed that all are using just one email address for all notifications. So I tried to make a submission test going to your email address. Can you check if you received an email on your inbox with the subject line New submission: notification testing? If you can't find anything on your inbox, can you check your spam / junk mail folder? Have received your test submission! Hope I made myself clear and in case of any doubts or further information needed, please, don’t hesitate to contact me. 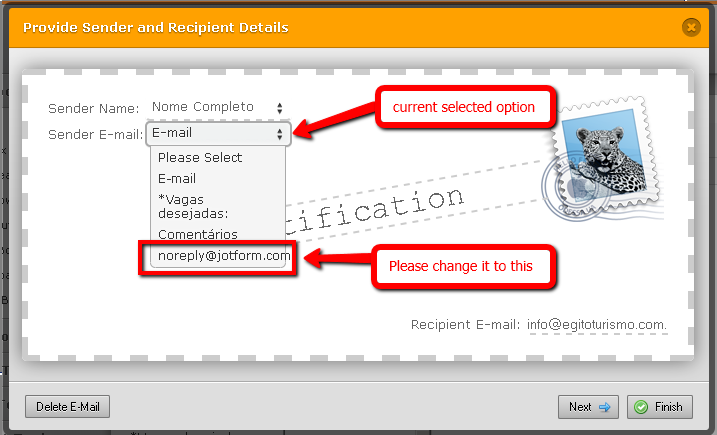 Changing your form's notification Sender Email address to noreply@jotform.com might solve the issue. Could you please try also to whitelist JotMail's IP's Addresses and do let us know if the said issue still persists or not. If you’ve sent it using the provided form in my webiste, please be informed that i didn’t receive anything neither in my inbox nor in Junk emails. Please let us know if you need further assistance and/or clarification.